Here are a few of my favourite festive recipes to be used with your ESPRESSOcap coffee system that give your party that little extra boost. 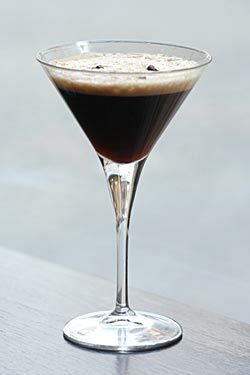 Ingredients: 1 oz "gran aroma"espresso, 1 1/2 oz Vodka, 1 1/2 oz Kahlua coffee liqueur,1 oz white creme de cacao. Directions: Pour ingredients into shaker filled with ice, shake vigorously, and strain into chilled martini glass. It should be somewhat frothy. Ingredients: 1 oz. brewed "arabica" espresso, 1 oz. "corrected" with a shot of liquor of choice either Grappa, Sambuca, or Brandy. Option 2, you can make this an alcohol free experience by not adding the liquor and by just adding one Novaroma sugar packet of Anice-Sambuca with every espresso. Directions: Add all the ingredients together or enjoy the shot on the side. Ingredients: 6 oz. hot milk (non-fat can be substituted) 2 teaspoons instant hot chocolate mix, 1 oz. brewed "decaffeinato" espresso, 1 oz. Irish creme, 1 oz. vanilla or regular vodka. Directions: Add all ingredients into a 12 ounce beer mug, stir well. 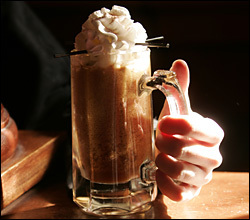 Garnish with whipped cream and a small dash of instant hot chocolate mix. 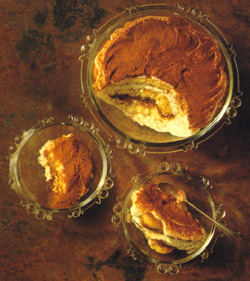 Ingredients: 14 oz ladyfingers, 14 oz marscapone cheese (or ricotta), 4 eggs separated, 4 oz sugar, 2 cups "Top Classic" espresso, 1 large shot of Marsala, 1 cocoa and powdered sugar. Directions: Beat egg whites until stiff white peaks. In a separate bowl, beat egg yolks and sugar until creamy and lemon colored. Add marscapone cheese to egg yolk mixture, beat until smooth. Then fold in the egg whites. Soak the ladyfingers in the coffee and Masala, and make a layer of half of them. Cover layer of ladyfingers with half the cheese. Repeat layer of ladyfingers and layer of cheese. Mix together about 2 tsp of cocoa with 2 tsp powdered sugar, and sift over the top. Cover and refrigerate.